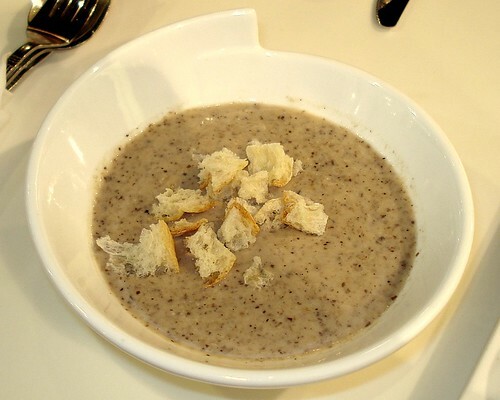 Mushroom soup, originally uploaded by Camemberu. The CaffeBar is tucked away at the far end of Parkway Parade but you can't miss the posters advertising its set meals. Some pretty good deals here, all day, every day - meaning not just for lunch on weekdays, as these "value sets" tend to be. Three types for you to choose from - Executive Set $12.80, Gourmet Set $18.80 and Cuisine Set is $19.80. You get a soup, a main and coffee/tea. Add $1 to upgrade your soup to mushroom soup (it's not too bad). 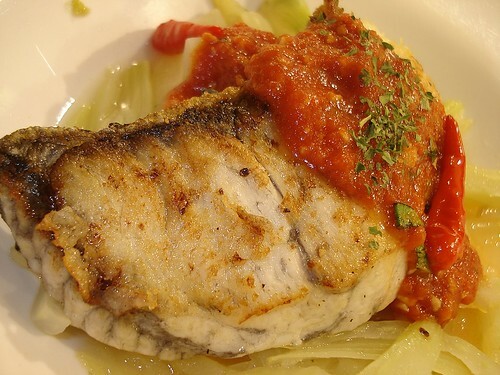 Pan-fried seabass with arrabiata sauce, atop braised fennel, originally uploaded by Camemberu. I took the Cuisine Set with pan-fried seabass and arrabiata sauce, atop braised fennel. Portion was small-ish (for me) but the seabass was fresh, nicely seared and cooked just right. First time I'm having the bulb part of the fennel plant, which has a very subtle flavour. Tastes almost like boiled nothingness, save for a lightly sweet, peppery, herbal aroma. I can't imagine that this plant is one of the three used in making absinthe. 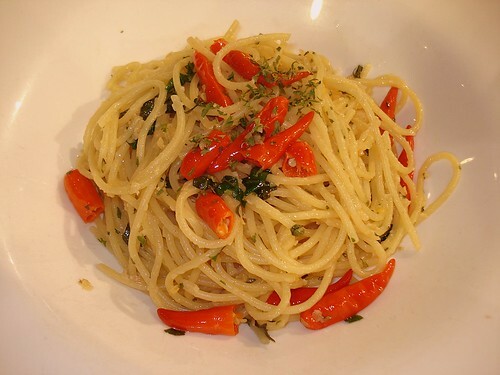 Spaghetti aglio olio, originally uploaded by Camemberu. Hubby chose the spaghetti aglio olio for his executive set. The pasta needed a healthy dose of salt and pepper but became really tasty after that. We loved the kick from the bright red chili padi (bird's eye chili). 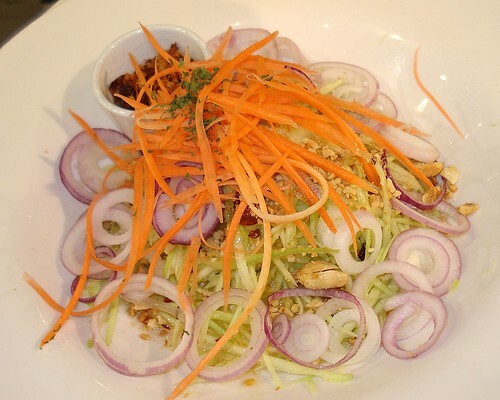 Thai green mango salad, as presented, originally uploaded by Camemberu. 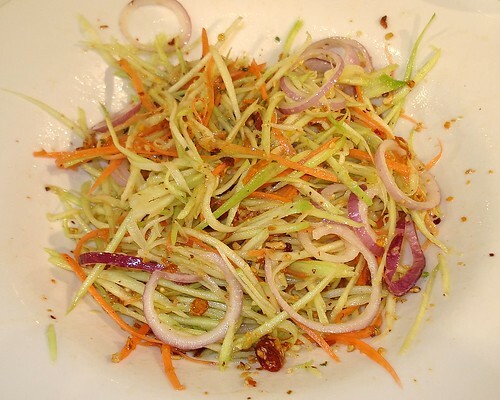 After tossing, the Thai green mango salad looks messy but tasty!, originally uploaded by Camemberu. ...i.e. tossing it high like yu-sheng! OK, salad tossing shenanigans aside, it was quite tasty. The deceptively tiny portions of dried shrimp and chili added a severe spicy bite to the dish. Yummy! 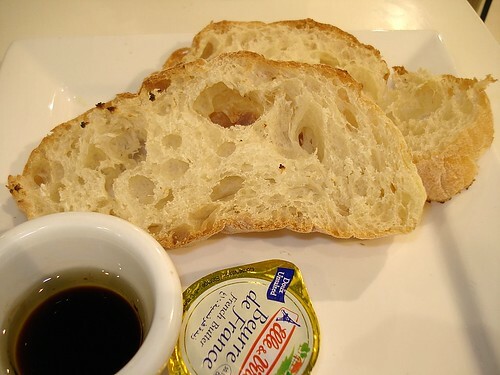 Free-flow ciabatta with butter, olive oil and balsamic vinegar, originally uploaded by Camemberu. Did I forget to mention free-flow sliced ciabatta comes with the meals? Well, all right, the breads are a bit forgettable. However, they do offer a nice touch in that you can toast your bread to your heart's desire. Plus free-flow olive oil and balsamic vinegar to boot! All very good if the set meals don't fill you up enough. 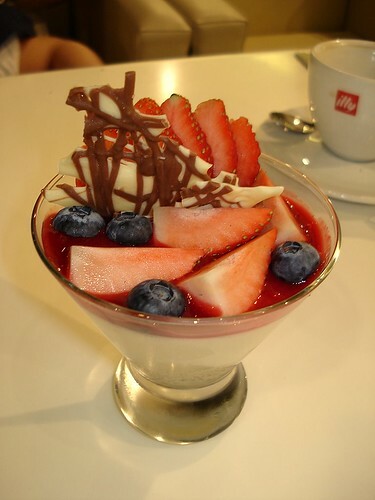 Vanilla panna cotta with berries, originally uploaded by Camemberu. We also sprung for the vanilla panna cotta with berries. Lovely fruit. Nice thick custard below, with real vanilla specks. However, it could have done without the gratituous white chocolate decoration wedge - those always taste awful, don't they? Incidentally, the owner of Bakerzin set up The CaffeBar for his sister. Also to showcase his desserts and confections. And if only I'd read up on CaffeBar earlier, I'd have known that its signature dishes are duck confit, salmon roulade and clam pasta, made by a chef that the Bakerzin boss specially lured over from an established fine dining eatery. Ah well, I know what I'm having next time. We were just there yesterday and I just wanted a cream pasta which I don't normally go for. The linguine is mushroom sauce was not too bad. Have tried the aglio olio. It was ok, nothing to shout about. Hey, try the mango chicken salad with Thai chilli sauce dressing at Dome. I loved that.